Because our military families living overseas live at, or just above, the poverty level, HRWF decided to help support our troops by clipping 'manufacturer's coupons' for food and household items from newspapers and magazines and mailing them to an overseas military base. These coupons are honored at PXs on American bases around the world and help defray the cost of family living. (They are even honored several months after the expiration date.) This is a very worthwhile program we are proud to support. As my late husband Bill was in the Air Force in WWII, in his memory, I chose a U.S. Air Force base in Okinawa, Japan, which had few sponsors. We may soon have to add another base or two as recipients due to the constantly growing volume of coupons we collect. In November of 2009, the face value of our first mailing was $5,988; our three mailings in 2010 totaled $45,011; 2011 mailings totaled $54,184; our first 2012 mailing was $30, 504. ◼ 3/13/2014 Update from Chris Wennerholm: On March 13th, we sent 2 boxes totaling $62,910. Our grand total since we started in November, 2009, is $408,279. Please give thanks to all who help with this worthy project. 12/10/14 Update: Dear ladies, I did a mailing today and the total was over $46,800. 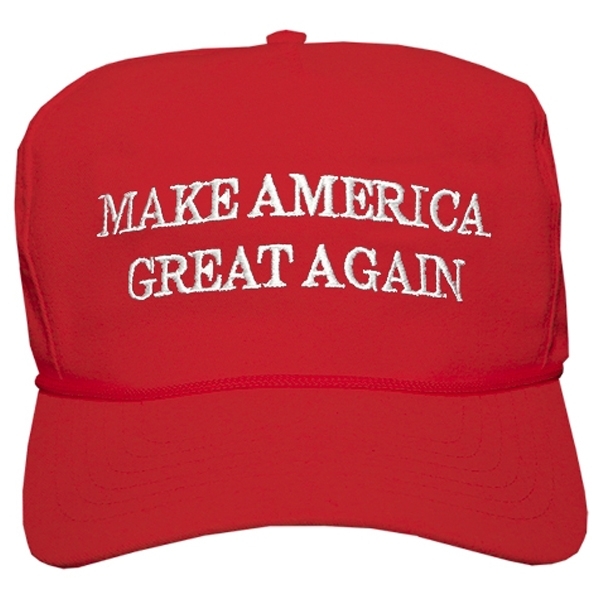 We should reach a half million $ by next year. Thanks to all of you and a very Merry Christmas to you and yours. 1. Cut out and trim Manufacturer's Coupons only. (use 2 baggies or envelopes; label each). candy, gum, mints, diet drinks, baby formula, drinks. cat food, cosmetics, cleaning products, etc. 5. Add up the face value of coupons in each category. "Up to $2.99," etc. ; otherwise, estimate. Headquarters, or the President at or before our next meeting. Thank you all so much for your invaluable help with this project. It is greatly appreciated by our troops, by HRWF, and by me. Chris Wennerholm 725-2020. THIS IS OUR BEAUTIFUL KEEPSAKE COOKBOOK CELEBRATING OUR 71-YEAR HISTORY AND LOOKING TO OUR TOMORROWS. 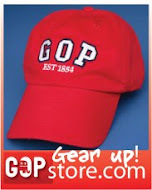 IT’S A MUST-HAVE FOR YOUR OWN COLLECTION AND PERFECT AS GIFTS FOR SO MANY SPECIAL EVENTS. DIVIDER PAGES FEATURE REPUBLICAN WOMEN — COME SEE THE MYSTERY LADIES. THEN FEAST YOUR EYES ON MORE THAN 350-RECIPES WELL TASTE-TESTED BY YOUR FRIENDS AND NEIGHBORS BY THEIR FAMILIES, FRIENDS, AND NEIGHBORS IN THE ULTIMATE TEST KITCHENS - THEIR HOMES! The multi-chaptered cookbook is filled with “tried and true recipes,” cookbook committee member Lynda Pozel said. Among those are the Leon's Car Care Center's famous butter crunch cookies, the handiwork of Elaine Warmuth. The 350 recipes included in the binder-style volume nearly all came from members or their families. 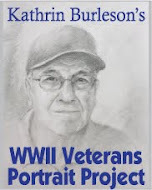 Proceeds from sales of “Tantalizing Cuisine” will benefit several of the organization's ongoing efforts including purchasing books for public schools, supporting military families and a new scholarship program. Other public outreach includes collecting coupons for overseas military families, donation campaigns for local food banks, receptions for Republican candidates and monthly luncheons with guest speakers. Each cookbook sells for $15 and is available from members. The organization also printed 24 collector copies, each signed by the women photographed for the divider sections, which are selling for $100. *Toothpaste -all sizes; toothbrushes - single wrap; soap bars - full size; & Chapstick. MELP is the NFRW’s oldest literacy program, celebrating more than 45 years of book donations from an approved list to schools and libraries. 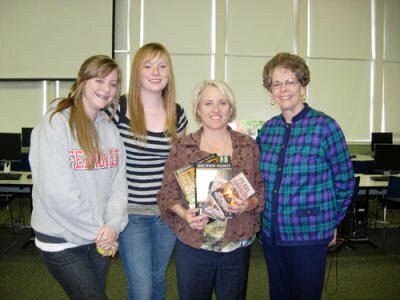 From the left: Kassidy Allardice, Stephanie Lentz, librarian Leanne McCulloch and Mary Scott. 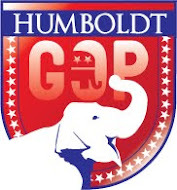 Humboldt Republican Women Federated (HRWF) offers a $500.00 scholarship, to be awarded to a deserving high school graduate. The scholarship includes an additional $500.00 to be awarded upon completion of their Freshman year provided the recipient maintains a 3.0 GPA during that year. ◼ Forms are available from High School Counselors, and you can Download or print the form here, at Scribd. Scholarship Application for Humboldt Republican Women Federated's $500 Scholarship. 1. A high school grade point average of 3.5 or more. 4. Two letters of recommendation: one from a teacher or counselor and one from a community member. 5. Completion of the application form. 6. Year two: When reapplying for the second half of the scholarship, include your freshman year's college transcripts (GPA) and proof of re-enrollment to HRWF by June 30 of that current year. The application must be received by May 1st. HRWF dues and donations support the scholarship programs. ◼ Additionally: The National Federation of Republican Women offers several scholarships and internships to female students. Click here for details. 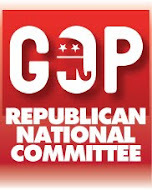 These scholarships are offered by the National Federation of Republican Women (NFRW). They are submitted through the State Federation. Applications from CFRW are first submitted to our Scholarship Chairman BEFORE they get submitted to our State President. 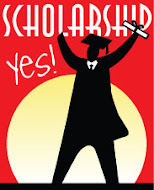 National Pathfinder Scholarship: Three annual scholarships of $2,500 provide financial assistance and support to women seeking undergraduate or graduate degrees. Undergraduate sophomores, juniors and seniors, as well as students enrolled in a master's degree program, are eligible to apply for the scholarship. Recent high school graduates and undergraduate freshmen are not eligible. Scholarship winners may not reapply. Deadline: Applications due to State Federation Presidents by JUNE 1. Betty Rendel Scholarship: Three annual scholarships of $1,000 are awarded to female undergraduates who are majoring in political science, government or economics and have successfully completed at least two years of college coursework. The recipients are chosen from applicants from across the nation. Scholarship winners may not reapply. The Dorothy Andrews Kabis Memorial Internship honors the former president of the NFRW (1963-67) who later was appointed U.S. treasurer by President Richard Nixon. The internship gives female undergraduates the opportunity to spend part of the summer working at national headquarters in Alexandria, Va. It includes a small monetary allowance, roundtrip airfare to and from Washington, D.C., and housing in the D.C. metropolitan area. Deadline: Applications due to State Federation Presidents by FEBRUARY 20.